Jane has a long association with Hogsback, having spent 13 of her childhood Christmas holidays with her parents at the Hogsback Inn. To commemorate these happy years, we decided to spend Christmas at the Inn on one of our “off” Christmas’s (Our children would be with their in-laws). One day after prolonged mist for days, we got cabin fever and decided to drive around the village.Down Orchard Lane, we saw that Mistlea was for sale. The gate was open, so we walked in and just wandered down a central, rough path to the ponds. The garden was completely overgrown, but Jane saw that it had once been a grand garden. It turned out that the owners, of some 30 years, had both passed away and their 2 children were divided about selling the property. The result was that it was let to many dubious characters for 10 years without any maintenance of the garden. 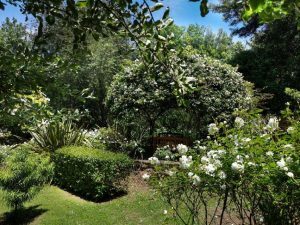 Jane worked as a landscape gardener in Port Elizabeth and we have a large country garden there. My job was keeping the garden equipment in shape and a bit of pruning and tree cutting (never trusted our staff with a chainsaw!) 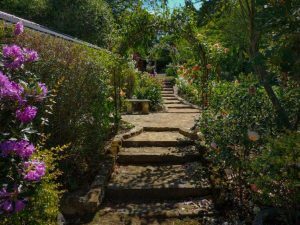 Coming to Mistlea was like starting over again – 90% of the plants and trees in the garden were new to us but common to northern hemisphere gardens, so I was happily dragged into the project. Mistlea was established in the 1950’s and contained beautifully mature Rhododendrons, Azaleas and other shrubs as well as trees like Chestnut, Copper Beech, Dogwood, Crab Apple, Liquid Amber, Maple, Red Oak, Pin Oak, Silver Birch etc but the rest of the property was waist high in grass and brambles and overrun with Black Wattle, Blackwood and a nasty invader called Bird Cherry (a Prunus varietal from South America). My first job was clear – get rid of the invader trees and start clearing the rubbish! Bearing in mind that we were coming to Hogsback for 4 days per month, I generated enough rubbish to keep our one gardener busy carting and burning for the rest of the month. Jane wandered around the garden for the first 6 months, not knowing where to start and defaulted to keeping an eye on the renovation of the house and the installation of watering points. We started clearing the areas closest to the house and having cut the undergrowth to the ground, we noticed a single daffodil flower appear. Jane figured that this must have been a flower bed and then shaped a bed with a hose as she would have done. Our gardener removed all the grass and by the next month, seemingly by magic, up came alstroemeria, dahlias, Chinese anemones, nerine, Michaelmas daisies, foxgloves, daylillies and many more. They had all been dormant under the grass and brambles! 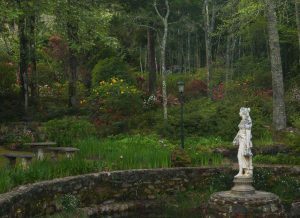 Now Jane was on a roll and started the reconstruction of the garden – the house is at the highest point of the plot and faces the Hogsback mountain. The whole garden and forest slopes downwards to the ponds. Rough terraces had been previously made, but with loose rocks that had been rearranged over the years by the large baboon troops in the area. We kept a stonemason busy for more than 2 years and my new brief was collecting enough stones all around Hogsback to keep him busy! 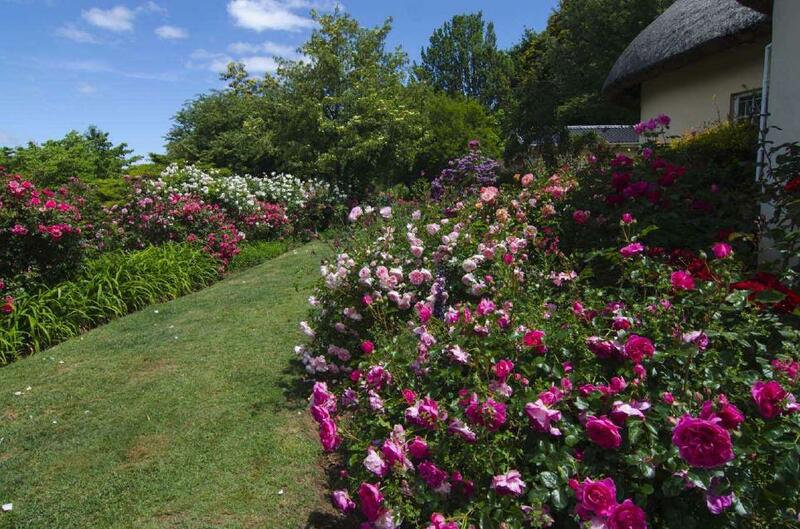 At the same time, Jane had fond memories of her Mom showing her roses in the Hogsback gardens as a child but noticed that there were hardly any roses at Hogsback when we arrived at Mistlea. 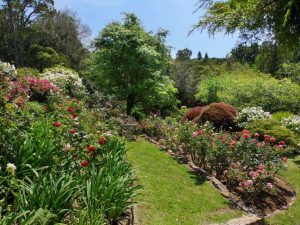 Having been voted in as chairlady of the Hogsback Garden Club within about 3 years, she made it her mission to bring roses back to Hogsback. We had 2 roses bushes at Mistlea at that stage, both General Gallieni. Jane bought in roses every spring for resale at a low mark up to local gardeners. What she did not sell, went straight into our garden! 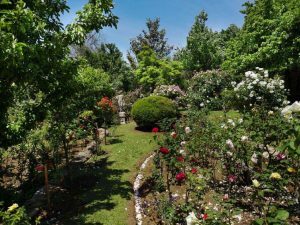 So, after about 10 years, we had used more than a thousand bags of cement and endless stones and sand for the stone terracing, paths and steps and had planted about 3, 500 roses. Many other gardens in the area now contained roses and Jane had achieved her mission with the help of some very special people, like the late Heather Leppan, who once arrived at our home in PE with 92 heritage roses in a VW Golf! Halfway through our project, we visited various English gardens and also bought an entire library of books from the RHS book shop at Wisley but were most influenced by 2 gardens – Sissinghurst and Great Dixter, the former giving inspiration for our rose arbour and white garden – well, almost white – some of the daylillies turned out to be yellow! 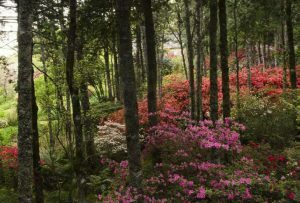 In her capacity as chairlady, Jane purchased many Azaleas from a local nursery for planting in various public areas. After one of these buying missions, she came home and proudly announced that we were the new owners of an Azalea nursery, as the current owner was leaving the mountain! I won’t reveal my exact response, but I eventually conceded defeat and started clearing the area now occupied by our nursery. Mistlea continues to challenge, energise and inspire us (often beyond our ailing physical capabilities !!!) and we are as excited each spring as we were in our first year. Mistlea is an open garden for the month of October as part of the Hogsback Garden Club fund raising for care of public areas, but as our first flush of roses is mid-November, we are happy to accommodate visitors by arrangement with Jane at that time when there are still some Azaleas and Rhododendrons in flower.